AWA’s signature event is an exclusive fall Sojourn in mid-October 2019. Many people come to Florence but very few have access to the heart of it. AWA’s signature event is an exclusive fall Sojourn in mid-October 2019. During AWA’s annual Sojourns, our guests become honored art patrons that are welcomed to a Florence you truly can't have access to in any other way. Ask yourself the following questions and discover why AWA's 2019 Sojourn is more than a 'must'. Download complete program here. Have you ever been 'welcomed home' to Florence? You'll never forget the hospitality of Florence's finest families as they welcome us into their homes—whether country villas or in-city palaces—for evenings of pure Tuscan joy. Have you ever been recognized in Florence as an honored patron? Have you ever seen the city's 'invisible art'? 'Hidden treasures' are part of AWA's DNA. Expect curator-led visits to storehouses and secret palace rooms and spectacular after-hours events in beloved museums, made possible by our decade-strong mission. Have you ever met Tuscany's most 'creative minds'? Our network of colleagues include the founders of modern-day artisanal companies and cultural centers who uphold Tuscany's age-old traditions—food, wine, craftsmanship, the performing and visual arts. 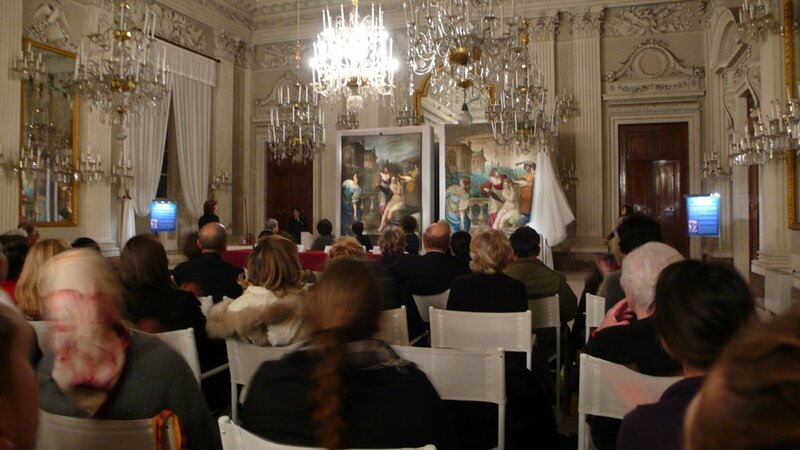 2019 is the year of Plautilla Nelli’s unveiling and we hope you will join us for 5 wonderful days in Florence. The following twelve events are the crux of the calendar and just a portion of the magic. A curator-led tour through Villa La Quiete. Once Renaissance convent-home to the daughters of noble Florentine families, its history was forged by two ‘Medici’ women: the art-loving Vittoria della Rovere, whose dowry was a windfall for Fernando II, and Anna Maria Luisa, who summered there annually, as of 1728. Known for the pact that clinched Florence’s cultural wealth for future generations, she conceived the villa’s Italian garden, created by the Boboli’s own Stefano Rapi. Where Leonardo ‘found’ his genius? Florence’s oldest hospital has not missed a day’s work since its founding in 1288 by Folco Portinari, the father of Dante’s beloved Beatrice. Because art was thought to inspire health and bore witness to the hospital’s power, their 700-piece collection boasts works by della Robbia, Bici di Lorenzo and Andrea del Castagno. It was here, from 1502 to 1508, that Leonardo dissected human corpses for his anatomical studies—some of the best ever created to date. Though this underground passageway is not usually open to the public, Sojourners will see where Leonardo studied corpses, which doubled as a tunnel linking Santa Maria Nuova to Florence’s women’s hospital, Le Oblate. 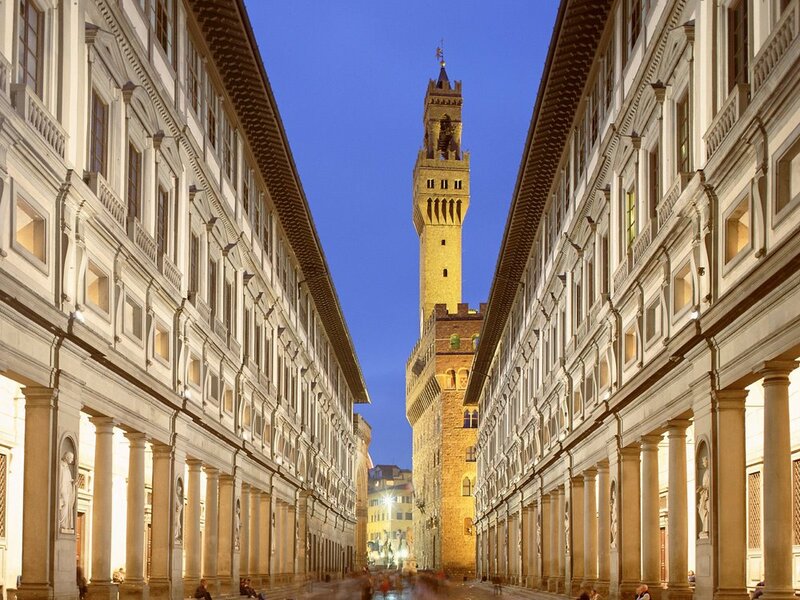 In the 1540s, Medici dukes Cosimo I and Eleonora de Toledo decided to turn Palazzo Vecchio into their royal home and fill it with works by Michelangelo, Vasari and Donatello. Seat of the ‘Signoria’ since the fourteenth century, it became City Hall in 1872. It is the civic heart of Florence and very close to our own hearts at AWA. For four years, the restoration of Nelli’s Last Supper has been curated by art historians and supported by City Museum executives and officials. Together, in the city’s most majestic venue, we will celebrate the ‘pre-party’ with dinner in the palace. Duchess Eleonora de Toledo was granted use of Santa Maria Novella’s Chapter House for religious feasts with the highest ranks of Spanish aristocracy, whom she brought with her to the Medici court. Her husband Cosimo I ruled Florence during Nelli’s time, and their marriage was one of history’s most successful. Because Nelli’s Last Supper is a precious sacred work for the artist’s fellow Dominicans, the monastery’s Prior will be celebrating mass to commemorate the painting’s unveiling, in this tiny jewel-like chapel with frescoes from the 1360s of unrivalled beauty. It’s the moment we’ve all be waiting for. Santa Maria Novella Museum will open its doors for Nelli’s 21-foot Last Supper. Expect a curator-led tour of this evocative venue and a pre-viewing of her masterpiece, the evening before the painting’s official presentation. On October 17, the restoration project will be presented in the Basilica of Santa Maria Novella, an unheard-of honor, followed by small-group viewings of the masterwork in the gallery proper. The festivities will include an aperitivo gathering in the complex’s ‘ancient Infirmary’. Weather permitting, expect a toast under the cloister arches with breathtaking views of the fully-frescoed Chiostro Grande. AWA’s Sojourn wouldn’t be the complete without a visit to the Opificio, a fortress-laboratory where a team painting doctors work to rescue much-loved canvases, panels and frescos. It’s one of the world top-three restoration labs. Paintings on their way to recovery vary year by year, but on past Sojourns we have been at arm’s length for Leonardo’s Adoration of the Magi, Vasari’s Last Supper and even Jackson Pollack’s Alchemy. In 2019, AWA is a partner of the Women’s Day exhibition at the Uffizi Galleries entitled ‘The Lexicon of Women’, focused on professional women, including artists from the late nineteenth-century. As a special gesture of thanks, the Uffizi has invited AWA Sojourners on a special tour of a portion of galleries, not generally open to the public. A surprise—where the only thing certain is a sense of wonder. One of Florence’s most famous fashion families also prides itself on upholding multiple local traditions. The country-side estate, Il Borro, is known for its valued Tuscan reds and the family’s in-town trattoria shares food and wines produced there. The Ferragamo will be with us on the night to introduce us to well-loved favorites—from cocktails to dessert. San Giovanni di Dio was once a Florentine hospital for plague victims and Amerigo Vespucci’s family home. Florence-based conservator Elisabeth Wicks will introduce Sojourners to two large scale paintings by eighteenth-century artist Violante Ferroni, which are ‘hopefuls’ for AWA’s next big restoration project. In a city filled with eclectic home-museums, we’ve been invited to the artisans’ quarter in via Santo Spirito to the Torre Lanfredini, a 12th century tower owned by the Bruschi family. A glimpse into medieval Florence and a private collection that is a window onto the Florentine identity. In 2005, AWA’s founder Jane Fortune went on a tour of the San Marco Museum and found the painting that changed our lives: Plautilla Nelli’s Lamentation with Saints. Seeing the painting needed attention, Jane asked the curator if she could fund its cleaning. Once off the wall, woodworms were discovered in the panel and a full-scale restoration began. The rest is history: AWA has since restored more than 60 works by women spanning five centuries. At San Marco, we will also visit the precious library and see in-storage manuscripts that represent Nelli’s earliest painted works. The monks’ cells (featuring Beato Angelo’s famed Annunciation) gives us a glimpse of how Nelli would have lived, in the sister convent across the street (now demolished). Palazzo Capponi, the stunning fifteenth-century palace overlooking the river, has been chosen for the Sojourn’s Farewell Dinner. Immortalized in one of Giuseppe Zocchi’s ‘grand tour’ sketches, the palace was home to Niccolò Capponi and his wife Maddalena Vettori, a lady-in-waiting to Eleonora de Toledo, who ultimately made their match despite the wishes of the young woman’s stepfather. The ‘noble floor’ of this palatial venue is regal but ‘cozy’, a glimpse of aristocratic living during Nelli’s time. When, how and how much? When is AWA's upcoming Sojourn? *This fee includes a 1,000-dollar tax-deductible contribution to Advancing Women Artists, in support of the the organization’s mission. Your 1,000 dollar donation is non-refundable. When will I receive a full itinerary? Our website descriptions provide a general idea of Sojourn plans. Our full itinerary will be available on line by January 2019. It is subject to change, though any alternatives provided will be similarly unique. Participants will also receive an itinerary via email including 'wardrobe' suggestions. Is hotel and airfare included? AWA is not responsible for air transportation, hotel accommodations or airport pick-up. However, we have special hotel rates at AWA’s hotel of choice. The Lungarno Collection which gives a choice of luxury accommodation located right by Ponte Vecchio has reserved special rates for AWA until 15th June 2019. To learn more and reserve your room, please write to: l.lombardi@lungarnocollection.com specifying that you are part of the AWA Sojourn 2019. AWA accepts payments by check, bank draft or credit card. Guests have the option of paying in two installments of $2,500. Final balance is due by June 15, 2019.
or print the form and send with payment. Who do I contact for questions not answered here? For registration with more than 2 participants, please contact us.